To order The Divining Hand from Amazon.com, click here! "But as Christopher Bird points out in his The Divining Hand, ... 'throughout history, men and women characterized as diviners, dowsers, soothsayers, seers, mystics, mediums, clairvoyants, shaman, witch doctors, wizards & etc., have developed and practiced arts regarded as divine or demonic (depending on the viewpoint) and are able to answer questions that logical reason could not provide.' In essence, these people through self training, diligent practice and a profound knowledge of how the universe really functioned, simply 'knew things' via the faculty of what has been called the 'hidden senses' or E.S.P. In this vein, in 1949, a party of French explorers (while searching for evidence of lost civilizations in the Atlas Mts. of North Africa) stumbled upon a massive system of caverns known as the Tassili Caves, wherein many of the walls were covered with marvelous pre-historic paintings. Among the many fascinating wall murals, not only did they locate an art gallery devoted exclusively to the depictions of spacecraft and ET's, they also found a remarkable huge wall painting of a dowser, holding a forked branch in his hand searching for water, surrounded by a group of admiring tribesmen. These wall murals were carbon dated and found to be a least 8000 years old. During several research journeys to Egypt and the Middle East, I have photographed etchings on 4000 year old temple walls of pharaohs holding devices in their hands resembling dowsing tools. Cairo Museum is holding ceramic pendulums which have been removed from thousand-year old tombs. In China, there is an etching of Chinese Emperor Yu who ruled China 2500 years ago, and in his hands he holds a rather bulky turn-pronged device that resembles a dowsing device. Many passages in the Bible allude to dowsing, relating in considerable detail how both Moses and his son, Aaron, used a dowsing device referred to as "the Rod" to locate and bring forth water. In the Old Testament, the Prophet Eziekiel reports that King Nubucadnezzar of Babylon, uncertain as to which city he should attack. Jerusalem the capital of Judah or or Rebath of the Ammonites (today's modern-day Amman, Jordan) directed his dowsers or deviners to select the best target and they chose Jerusalem, leading to its seizure and the long "Babylonian captivity of the Jews". The Jews learned the ancient art from their captors and in the Old Testament Prophet Hozea wrote: "They now consult their pieces of wood then the wand makes pronouncements from them!" The historical records of Greece refer to dowsing and the art was widely practiced on the Island of Crete, as early as 400 BC. Researchers have uncovered evidence that the Pytheon Oracle of Delphi used a pendulum to answer the questions posed by her clients, kings, queens, nobility and military commanders who traveled great distances to confer with her. In this regard, E.S. Cumbie in his fine book entitled, "The Psychometric Pendulum and the Pendulum Board" has this to say about dowsing and the ancient priesthood. "In ancient times, the priesthood felt that the layman did not have the belief, knowledge or training to contact the cosmic mind for enlightenment. So the poor people were forced to rely upon the priests to gain the guidance they sought from a higher source and the priests used dowsing devices to make this contact." For example, in Ezra 3:63 of the Old Testament, it is written: "The governor told the people not to partake of the most holy food until the priest contacted Urin & Thummin". In Samuel 28:6 it says, "When Saul inquired of the Lord, the Lord did not answer either in dreams by the prophets or by Urim & Thymmin". Cumbie is convinced that the words Urim & Thumin referred to dowsing devices which could have supplied crucial information and sometimes refused to do so because the priestly dowser held the wrong attitudes or phrased their questions in an incorrect manner. The blind Greek poet Homer refers to dowsing as Rhabdomancy, which means Devining Rod in Greek. That same word is still used today in the Italian language to denote dowsing. In his monumental work "The Oddesy" Homer also called the dowsing rod the Caduceus, which was passed from Apollo (or Hermes) to Asclepious, the ancient Greek God of healing. This mystical, legendary staff with its entwined serpents has become the universal symbol of healing, used by medical societies around the planet. Back in the 1400's, dowsing as we think of it today, was called "Virgula Devine" in Latin which meant dowsing with the rod shape. In Germany, during this period of time, dowsing devices were used extensively by miners seeking mineral ore, who referred to the forked stick as "Deuter" - an umbrella word in German - meaning "to show", "to indicate", "to point out", "to auger", "to strike". 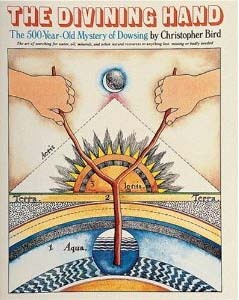 According to Christopher Bird, author of the classic book, "The Divining Hand", no one is absolutely certain of the origin of the verb to dowse". But it seemingly made its first official appearance in 1650 in an essay written by the famous English Philosopher John Locke whose noble writings inspired the framers of our own Declaration of Independence and The Constitution of the United States. In his essay, Locke wrote that by the use of the dowsing rod, one could devise or discover water and precious minerals (such as gold & silver and mineral ore) Locke has appropriated his phrase from the long dead English west country language of Cornwall - where in Cornish Dewsys meant "Goddess", and "Rhod" meant tree branch, and from which he "coined" the phrase - Dowsing Rod. In the 1700's and 1800's in England, Germany and France various books on mining and engineering referred extensively to dowsing, including the "1747 Mining Dictionary" and again in Bordlase's 1758 "Natural History of Cornwall", and also "The 1831 Quarterly Mining Review". Because the ancient art was widely used by miners in Germany for hundreds of years to locate water and ore deposits, today in that country libraries and museums of natural history, science, mining and engineering, private collections of art and sculptures have displays of woodcarvings, paintings and drawings, porcelain creations, coins, etc ... featuring dowsers holding forked sticks. Interestingly, London, England's 1912 edition of "Mining Magazine" published the first translation of a Latin Opus into English. It was called "On Metals" in praise of dowsing which had been first published 356 years earlier. The translators were a professional American mining engineer and his wife. The engineer later gained fame and won notoriety as the 31st President of the U.S. -- Herbert Clark Hoover. As Chris Bird notes, "God knows, had President Hoover been an expert dowser himself, he might have predicted, and therefore, prevented the great stock market crash of 1929." Collectively, in some of the world's finest libraries (e.g. The Library of Congress, The Widener Library of Harvard, The Sterling Library of Yale) you can find approximately 3,500 specialized books on the ancient art and the list grows steadily all the time. First the question -- what is dowsing? Well, for those of your who are unfamiliar with the term, let me say that you won't find anything of value in current dictionaries or encyclopedias. Those comments, prepared by orthodox scholars, are incomplete and inaccurate, giving only a few descriptions, generally summarizing all with the cryptic comment, that dowsing is simply "folklore". But as Christopher Bird points out in his "The Divining Hand", ... "throughout history, men and women characterized as diviners, dowsers, soothsayers, seers, mystics, mediums, clairvoyants, shaman, witch doctors, wizards & etc., have developed and practiced arts regarded as divine or demonic (depending on the viewpoint) and are able to answer questions that logical reason could not provide. in essence, these people through self training, diligent practice and a profound knowledge of how the universe really functioned, simply "knew things" via the faculty of what has been called the "hidden senses" or E.S.P. Engineer Raymond C. Willey's (one of the founders of ASD back in 1961) 1970 book "Modern Dowsing" gives on the the best definitions I have encountered. Willey says: "Dowsing is the exercise of a human faculty, which allows one to obtain information in a manner beyond the scope and power of the standard human physical senses of sight, sound, touch, etc." Author Chris Bird says that "to dowse" is to search for anything. This is generally down with the aid of a hand held instrument, such as a forked stick, a pendulum bob on a string, L-shaped metal rods or a wooden or metal wand. The next question is simply: How does dowsing work? Countless theories abound, even today, yet, I am not absolutely certain that any one, or even a combination of such theories, discloses the whole story. I am persuaded that Moses and the ancient priesthood clearly understood the mechanism by which it worked, however, they never released such critical data to the masses. Therefore, recognizing that to have done so, would have meant a loss of power and prestige for them. The premier consideration is simply this - dowsing works - and with proper understanding, training, time, patience, study and regular practice (especially in the beginning stages) it will work for the most important person in the world - you! When inventor Thomas A. Edison, was once asked, "What is electricity?" He replied: "I don't know either - but its there - so lets use it".